Who needs a grill to make kabobs? With the recipe below from Good Eggs, you can make delicious and healthful kabobs on the stovetop, using a cast iron pan to char the meat. A hot cast iron pan yields all of the smoky flavor of a grill—and a lot more. Cast iron vessels have been used for two thousand years. The first known use was during the Han Dynasty in China, 206– 220 C.E. Cast iron cookware was prized for its durability and ability to retain heat—a challenge when cooking in a hearth or an even iffier open fire (the kitchen stove was not created until the mid-19th century). The original cast-iron vessels were cauldrons and pots. The flat cast iron skillet as we know it appeared in the late 19th century. While cast iron cookware was popular among home cooks during the first half of the 20th century—along with affordable aluminum and expensive copper—the second half led to stainless steel, less durable and flexible but more attractive. Even more attractive and less durable was the pricier enamel-coated cast iron, like Le Creuset (the enamel coating will chip if dropped and can’t be repaired). Nonstick, easy to clean Teflon-coated cookware became the choice of housewives beginning in the late 1960s, although cast iron, copper and stainless continued to be used in professional kitchens. Here’s a longer history of cookware, which began with animal hides in prehistoric times. And they’ll endure forever. Ours was purchased by our grandmother in the 1920s! Today, a 15-inch cast iron skillet, large enough for steaks and chops, is $40. READY FOR A CAST IRON SKILLET? Cast iron skillets are available from the petite (6 inches in diameter) to the jumbo (17 inches). Lodge, a top producer of cast-iron cookware, sells them in one-inch increments (6, 7, 8, 9, etc). Lodge-brand pans, our favorites, are pre-seasoned and ready-to-use, eliminating the main objection to buying cast iron. 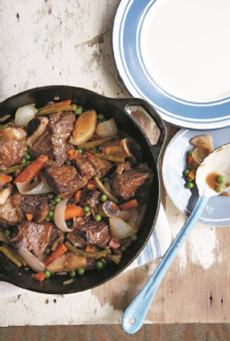 Top: A cast iron skillet is the beginning of a cooking odyssey. 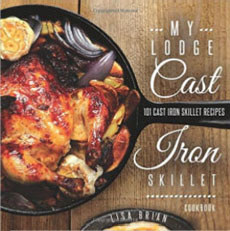 Three cookbooks from Lodge are also a good start. Bottom: A 15-inch cast iron skillet from Lodge Manufacturing in Tennessee. A line with beautiful craftsmanship, it is the only cast iron cookware manufacturer still in the U.S. Delivers the best heat distribution, which is why it’s the choice of professional chefs. The ability of cast iron to withstand and maintain very high cooking temperatures makes it best for searing or frying. Using cast iron ensures that there’s no “hot spot” on the pan, when some of the food cooks faster, overcooking or burning it before the rest of the contents are ready. Versatility: Excellent heat retention makes cast iron preferable for braises, stews and other long-cooking, as well as quick-cooking dishes like eggs and grilled cheese sandwiches. Before there was bakeware, cast iron skillets were used to make breads, cakes, cobblers, pies, and so forth. Is a “grill” for apartment dwellers, providing char, smoky flavor and a perfect crust on fish and meat. Is nonstick after seasoning. Seasoning must be done before first using the cookware, to create a nonstick surface and prevent rust. It is the process of covering the cooking surface with vegetable oil and baking it at 250°F for 90 minutes. When the pan cools down, the oil is wiped off. After each use, the pan is not washed, but wiped. While this is very easy to do, the concept is foreign to many modern cooks, who therefore avoid cast iron. Can be heated beyond 500°F, the limit of stainless steel. Campfire temperatures average 1,571°F. Provides great performance at a low price for a long time. You can cook anything in it, and it goes from stovetop to oven. If a minuscule amount of iron leaches into your food, that’s a good thing—like taking an iron supplement. Feast on tender chicken and charred vegetables. Prep time is just 20 minutes, and you can marinate the chicken overnight. This dish pairs well with a side of grains—ideally whole grains (barley, brown rice, bulgur, quinoa, etc. ), but is fine with good old, less nutritious white rice. Three of the four vegetables here are spring vegetables. You can substitute any veggies you like. *If you don’t have skewers, you can cook the chicken pieces without them. 1. PREHEAT the oven to 400°F. Place the bamboo skewers in a large bowl of water and soak for 5 minutes. (Or cook the chicken without skewers. It will taste the same, but skewers are a more special presentation.) Mix the marinade ingredients in a large bowl, add the chicken and toss to combine. 2. THREAD five cubes onto each skewer. 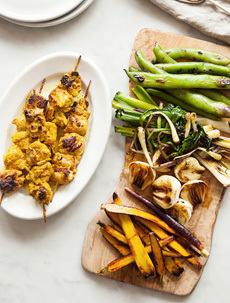 You can do this in advance and store the prepped kebabs in the fridge for up to 24 hours. 3. HEAT a large cast-iron skillet, then add enough two tablespoons of olive oil, or as much as you need browning. Brown the chicken on all sides, about 2 minutes per side; then place the entire pan into the oven. Bake for 5 minutes or until the internal temperature of the chicken is 165°F. Remove the kebabs from the skillet and set aside. 4. HEAT a second large pan (or wipe the first pan clean), adding the olive oil when the pan is very hot. Add the vegetables in one layer without crowding (cook in two batches if necessary). Cook for 2-3 minutes, then flip and cook for another 2-3 minutes. When the vegetables are a bit tender, very browned and (hopefully) a bit charred, remove them from the pan. 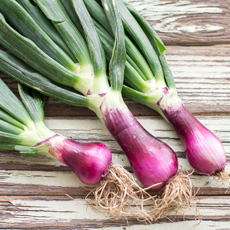 Dress with a squeeze of lemon and a pinch of salt, and serve alongside the kabobs.